Joseph was born in Malek, in South Sudan. His father was a head teacher. The war in South Sudan affected Joseph’s family greatly and marked Joseph’s early life significantlly. Later on, Joseph represented Sudan as a member of the Olympic team and ran in the 3000 metres steeplechase in the World Championships and other international games. He has also been pan-Arab World high jump champion. He went to Sweden for theological training in 1982 and to England in 1984 studying English at Whitby (where he met Karin who was also studying). After completing a degree in Theology at Trinity College, Bristol, he was ordained in 1988 in Salisbury and served his curacy in Swanage. Joseph and Karin were married in 1990 and they both joined the Church Mission Society serving in London (in Bermondsey, Earlsfield and Barnes) before they left for Northern Uganda to work in South Sudanese refugee camps. Here Joseph led the youth ministry and theological lay training and Karin worked with UNHCR and Médecins sans Frontières as a nurse. On return to England in 1995 he worked as a Team Vicar in West Dorset. To support his fellow Sudanese he sent bicycles for teachers, and achieved BBC publicity for the situation in his home area. 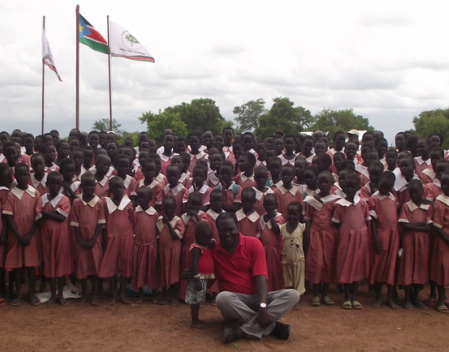 In 2000 Joseph and Karin set up the ‘Under Tree Schools’ project in Aweil South County. In 2002 Joseph and Karin with their two daughters moved to Alexandria in Egypt. They worked as mission partners for the Church Mission Society setting up a ministry for Sudanese refugees providing a centre and a primary school to help them develop their skills for the future, and a medical clinic. They were there for three years. From 2005 until 2009 Joseph was Hon. Assistant Priest in the Barnes Team Ministry in southwest London, where both he and Karin supported the work of the Team Ministry. From October 2006 Joseph worked as Director for Religious Affairs in the Government of South Sudan responsible for promoting reconciliation, inter faith relations and advising on the religious education element of the new South Sudan school curriculum. In the autumn of 2009, Joseph and Karin with their family moved to in Worcestershire where Joseph was Team Vicar in the Kidderminster East Team Ministry. They continued to visit South Sudan on a regular basis. Soon after that, Joseph was asked by the President of South Sudan to join the Ministry of Foreign Affairs and Joseph has been made an Ambassador. Since the start of summer 2012 he has been working in Juba and travelling abroad being involved in strategic work to build up the new country. It is vital to both Sudan and South Sudan to live peacefully as neighbours, if not, both countries suffer. He expects to be assigned to head one of South Sudan’s new embassies.